^"Travis, set a course out of the system"
^"Take us out, Travis...straight and steady"
^"T'Pol, i want a detailed scan of the nebula"
yeah maybe i should have....but what do u guys think? cant wait to seee more. When u get on MSN i wanna talk to ya about your planets, i got somthign that might interest ya. ^"Captain, we've found the Banshee.....She's derelict and has heavy damage"
those are nice ships Warren. keep up the good work. 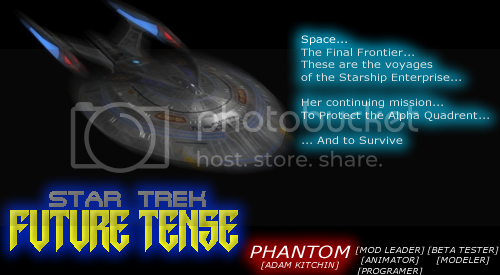 ^"Ensign, plot a course to rendevous with the Defender"
^"This is Hikaru Sulu, captain of the USS Excelsior"
^"Lieutenant set a course to rendevous with the Enterprise"
I think your mod is prgressing very fast . I was looking forward to see new mods for Armada1. yeah max i know that its the refit excelsior, but i like the look of the refit better than the standard excelsior anyways lol.